The lunar cratering rate is known reasonably well from comparison of observed crater frequencies with radiometric ages. Attempts to obtain a cratering rate for Mars have usually been based on calculation of the relative flux of asteroidal and cometary bodies on Mars and the Moon. The asteroidal flux on Mars cannot be obtained in a simple way from the observed number of Mars-crossing asteroids, i.e. those asteroids with perihelia within the orbit of Mars. 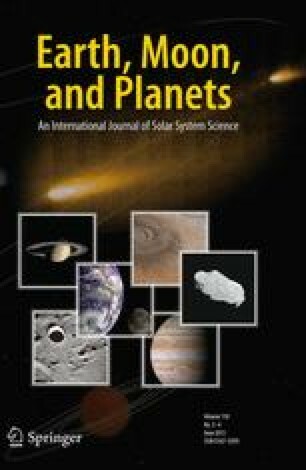 Calculations of the secular perturbations of these asteroids by several authors, particularly williams, has shown that most of these bodies rarely come near even to Mars' aphelion when they are in the vicinity of the ecliptic plane, and their contribution to the Martian meteoroid flux is much smaller than has been commonly stated. Ring asteroids in the vicinity of the ‘secular resonances’ discovered by Williams, high velocity fragments of asteroids on the inner edge of the asteroid belt, and possibly objects obtained from the 2:1 Kirkwood gap by a process described by Zimmerman and Wetherill are probably of greater importance in the 103-106 g meteoroid size range but are much less important in the production of large craters. Calculations of the Martian asteroidal and cometary impact rate are made, but the present unavoidable uncertainties in the results of these calculations result in their being of little value in establishing a Martian chronology. Suggestions for improving this situation are discussed. Paper presented at the Lunar Science Institute Conference on ‘Geophysical and Geochemical Exploration of the Moon and Planets’, January 10–12, 1973.